No! To War Against Civilians In Gaza! I don't want to get into the politics of the Israeli-Palestinian conflict too much since it is a very divisive issue on which most people have already formed their opinions. I might only add that, given the amount of misinformation and disinformation that is out there from all sides, these are generally uninformed opinions. The Washington Post is keeping a "Gaza Counter", tracking the toll of the 2014 conflict. As of July 27, out of 1,046 deaths, 760 are reported to be Palestinian civilians. The United Nations confirms the civilian cost of the conflict. What's different in this round of the conflict is the backlash against Israel on social media and in many activist communities across the United States. This is difficult to notice if you are only following U.S. mainstream news outlets, but globally speaking, especially on social media, Israel is losing the propaganda war. A fact readily acknowledged by the Israeli PM Benjamin Netanyahu. After all, it is hard to spin the deaths of over 200 children. 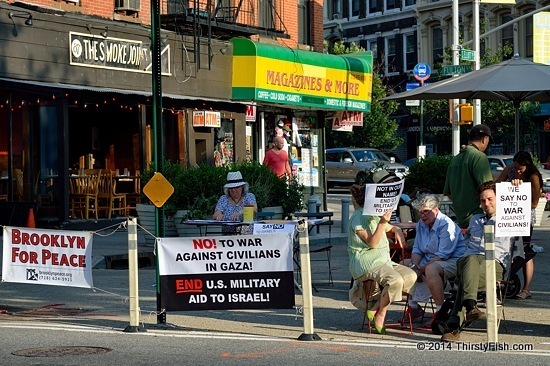 Despite that, growing anti-war protests in Israel and elsewhere are rarely covered in the U.S. media. PM Netanyahu is arguing that "Israel can lose on PR but not security". One has to ask, just how is the killing of over a 1,000 people, 75% of whom are civilians, going to make Israel more secure? Photographed yesterday at a park in Fort Greene, Brooklyn.